Johann Pachelbel was born in and died in Nuremberg in Germany. He was a leading organist and composer during the baroque period, and an indirect musical influence on Johann Sebastian Bach. He was a friend of the Bach family and taught Johann Sebastian's older brother Johann Christoph Bach who in turn taught his younger brother. Pachelbel's career as organist included a post at St. Stephen's Cathedral in Vienna, and also at the courts of Eisenach and Stuttgart. Two of his sons (Wilhelm Hieronymus and Carl Theodore) were also destined to follow in Pachelbel's footsteps as organists and composers in their own right. Pachelbel received a full musical education and by all accounts was a gifted musician. He also served as an organist while continuing his studies. Many aspects of his life have not been well documented but it is clear that he held a number of posts at various churches and cathedrals, and in courts in various parts of Germany. It was at one such post in Eisenach that he first met Johann Ambrosius Bach (J. S. Bach's father) and tutored Johann Christoph (J. S. Bach's older brother). In Erfurt he continued his close friendship with the Bach family particularly Johann Christian (a cousin in another branch of the Bach family) with whom he stayed for a time. When Johann Christian died in 1682, Pachelbel purchased the house from his widow. Soon afterwards Pachelbel married and started a family. Most of the posts he held involved composing, and he composed a steady stream of works during much of his life. Eventually he moved back to Nuremberg where he continued to compose until his death at the age of 53. Pachelbel's music was also a foretaste of Bach's in some ways. He composed keyboard suites, toccatas, preludes, and a vast number of fugues for the organ. He also composed much chamber music for different combinations of instruments (including 6 suites for two violins) and choral works including motets and choral preludes. His music is said to have pioneered symbolism by using certain scales and chords to represent particular moods. By far his most famous work is the Canon and Gigue in D major for three violins and Basso continuo. The Canon part of this work (often called simply "Canon in D" or "Pachelbel's Canon") is particularly popular and has been arranged and performed in diverse ways. The Canon is now firmly established as a classical favourite, frequently appearing on classical and "chillout" charts, and is very popular at Weddings. 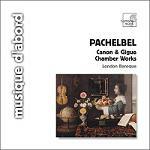 To represent Pachelbel's music on mfiles we have two slightly simplified arrangements of his famous "Canon in D". And this version is for four recorders: Canon in D for 4 recorders (You can also download this as a Sheet Music Score, parts for Soprano, Alto, Tenor and Bass recorders, as a MIDI file or as an MP3 file).